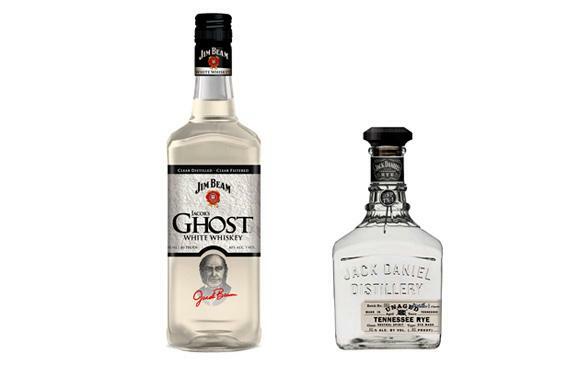 White dog whiskey: Could Jack Daniel’s Unaged Tennessee Rye and Jim Beam’s Jacob’s Ghost put microdistilleries out of business? In fairness, the unaged spirits on the market now taste far better than the illegal kind. True moonshine typically comes from whatever cheap ingredients are available, which oftentimes means fermented sugar or rotten fruit. Shows like the Discovery Channel’s Moonshiners—think Li’l Abner meets Breaking Bad—are about an industry where illegal spirits come in reused soda bottles and are sold from back alleys. Legal distilleries, on the other hand, use high-quality grains to distill raw spirits with the potential to become bourbon or rye once they spend a few years mellowing in barrels and absorbing flavor from the wood. Without that final step, however, white dog is to whiskey what coal is to diamonds. Then again, distilleries obviously don’t charge what a product is worth; they charge what people will pay. Smaller economies of scale mean microdistilleries might have to charge more than giants like Beam or Daniel’s, but novelty and status also play big parts. Vodka is a perfect example of this: The difference between a $20 bottle and a $50 bottle is often just $30 and an advertising campaign featuring a celebrity. (Vodka is usually distilled at a much higher proof than white dog, so it has a more neutral flavor; vodka is also different from white dog in that it’s not always made from grains.) Pricing for gin, which is basically vodka flavored with aromatics such as juniper, can also be arbitrary. Vodka and gin go for chic, however, while white dog goes for folksy. Beam and Daniel’s follow suit by charging more for less. A 750-milliliter bottle of Daniel’s unaged rye costs $50, which is more than its Single Barrel Whiskey costs. Jacob’s Ghost costs $22, which is $6 more than Beam’s famous white-label brand. Jacob’s Ghost is made exactly like white label but is aged for one year instead of four. Regardless of their relatively high prices, Unaged Tennessee Rye and Jacob’s Ghost still cost less than some of their microdistilled competitors. With their giant budgets, Beam and Daniel’s can afford to saturate the market and give those who are curious about white whiskey a chance to see how it tastes (and then probably never buy it again). So why was white dog so popular when it first arrived in bars a few years ago? Many whiskey drinkers were simply curious about how whiskey tastes before it enters the barrel. Joe Riley, fine spirits manager at Washington, D.C., spirits distributor Ace Beverage, said that white whiskey sold well when it first came out, but he has reduced his selection because it doesn’t get a lot of repeat buyers. “They don’t know what to do with it,” he said. Bill Thomas from Jack Rose Dining Saloon said he used to offer tasting flights of white dog for the curious, but demand quickly fell off. The initial hype around white whiskey was also exacerbated by the resurrection of cocktail culture, which has created an intense demand for new products. Most of the people I spoke with thought white whiskey’s chances of survival depend on that cocktail revival. But while there’s nothing wrong with nostalgic craft cocktail bars taking their decorating tips from speakeasies, the truth is that many of those older cocktails were invented to mask the horrible taste of illegal moonshine. This irony was noted by Derek Brown, co-owner of two bars in Washington, D.C., while he defended white whiskey’s place in today’s cocktail scene. Brown invited me to Columbia Room—which is to bars as the French Laundry is to restaurants—where he and the staff proved his point with white whiskey versions of a Manhattan and a sour. Each drink used citrus to complement and transform flavors that I normally find disagreeable. The experience felt a little like Thomas Keller making me the best meal I’d ever eaten out of frozen vegetables and Spam. Still, Brown and his staff are masters—some might even call them alchemists. White whiskey’s survival seems bleak if it depends on the occasional curiosity of whiskey geeks or home mixologists matching the prowess of places like Columbia Room. Combined with the looming threat of Daniel’s and Beam devouring the market, young distillers relying on it for their livelihood could easily find themselves out of work. That would be a shame. Those microdistilleries represent a big part of an American whiskey renaissance that promises to do for whiskey what small brewers did for beer 20 years ago. Many microdistilleries have shown a willingness to break from tradition and take risks their more established counterparts generally avoid, like experimenting with different ingredients or aging whiskey in different types of casks. In order to survive while building their brands, however, microdistilleries might want to take some lessons from the moonshiners and bootleggers that many of them base their advertising campaigns around. During Prohibition, gin was popular because it was more tolerable-tasting than moonshine and didn’t require aging. Like white dog, gin is distilled from grains, but it passes through botanicals like juniper berries, coriander, and cardamom to absorb appealing flavors. Making gin has been the strategy of a few smart upstarts such as Washington, D.C.’s New Columbia Distillers, which names its Green Hat Gin after the felt hat worn by a bootlegger named George Cassiday who supplied Capitol Hill during Prohibition. John Uselton, who runs the distillery with his father-in-law, said he’s had brisk sales of Green Hat Gin while developing a rye whiskey he plans to age for five years. That’s an eternity for such a young distiller—but drinking their gin while waiting for it is the perfect way to get the taste of white whiskey out of your mouth.